The rolling process produces a three dimensional pattern on flat aluminium sheets. The patterns are designed to maximize strength whilst giving greater impact and scratch resistance. Australian produced: Approx. 1 week from receipt of order. Australian Produced: Approx. 48 hours from receipt of order. 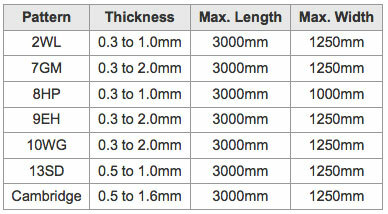 Below is a guide of patterns and sheet sizes available through our Parent Company in the UK. Material can be freighted to Australia economically with other stock orders so there are no minimum requirements. N.B. For requirements outside the above range please seek advice.